I can’t say that we enjoyed our time with you and 2 a.m. last night. We would rather sleep with you instead. This morning while we were getting ready for work, Brad told me that the reason he knew I’d been high for awhile was because my Dexcom alerts had invaded his dreams. He remembered in a half-awake state wondering why his work BlackBerry kept going off. When he finally woke and realized it was my Dexcom, he also realized I wasn’t waking up. He said that he shook me for a few minutes worrying that I had gone low and was already planning what to do if he couldn’t wake me so I could take care of myself. I’m not fond of these middle of the night diabetes interruptions. In fact they make me really mad, but being mad at diabetes is pretty pointless. I can say that I’ll be turning the sound alarm on when Brad is out on the West Coast for work next week. 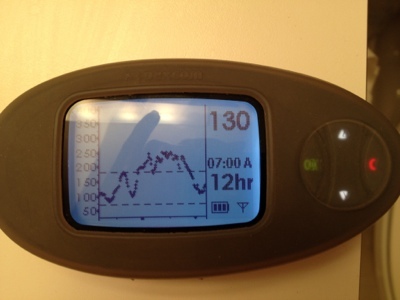 This entry was posted in Commentary, K-couple, My Life, Type 1 Diabetes and tagged Blogging, Dexcom, Diabetes, K-Couple, marriage, sleep, Type 1 Diabetes by Rachel. Bookmark the permalink. I could never imagine what it is like to live with something like that. It is wonderful you have a husband who loves and cares about you. Wow, how scary. Thanks so much for sharing – it’s been interesting to learn more about Type 1 Diabetes and how you’ve been living with it for the past year or so. And a belated congrats on your work anniversary – I can’t believe it’s been so long! Those middle-of-the-night awakenings have been killing me lately. I’ve been known to hit the snooze button on the alarm clock when it goes off, to press two buttons (any two buttons) on my pump/CGM to silence it — although if I don’t press the CORRECT two buttons, which is most of the time, it starts wailing again five minutes later. Between screaming CGM’s and crying babies, I think I’ve grown numb to the whole sleep thing. Tired, too.